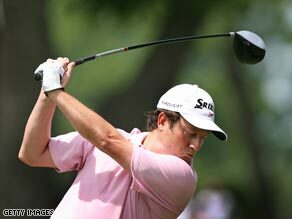 (CNN) -- South Africa's Tim Clark will take a two-shot lead into the final round of the $6.2 million Colonial tournament in Texas on Sunday as he eyes his first victory on the PGA Tour. Clark powers a drive away during his fine third round of 66 at Fort Worth. The 33-year-old, who finished runner-up to Phil Mickelson in last year's tournament, rolled home a birdie putt on the final hole for a four-under 66. It gives him a 17-under total of 193, with a three-strong group his nearest challengers. Mickelson, who is taking an indefinite break from golf as his wife Amy battles breast cancer, pipped Clark with a last-hole birdie after the South African finished strongly last year. "I had a great final round last year. I'm going to need that again," Clark told the official PGA Tour Web site www.pgatourcom. "I'm in a different position being in the last group. I just have to stay calm." Australian Jason Day, overnight leader Steve Stricker and Steve Marino are his nearest challengers. Marino fired a spectacular eight-under 62 to charge into contention while Fiji's Vijay Singh remains in the hunt after a 69 for 197. All the players and caddies wore pink clothing on the third day as a show of support in the fight against breast cancer, with Amy Mickelson firmly in their minds. "I think what we were able to do today is great," said Clark.